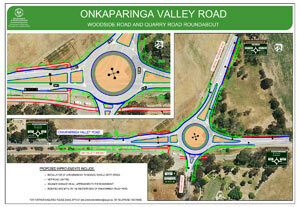 Construction of the new roundabout at the intersection of Onkaparinga Valley Road and Woodside Road at Woodside, is now complete. 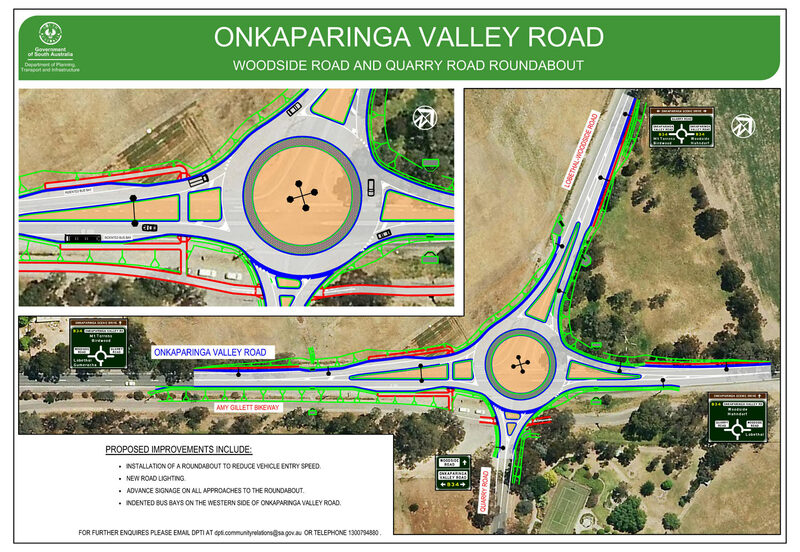 The Department of Planning, Transport and Infrastructure (DPTI) has improved road safety by installing a roundabout at the intersection of Woodside Road, Quarry Road and Onkaparinga Valley Road at Woodside. This $3.3 million safety driven project is funded by the Rural Road Safety Program and will assist to reduce the number of serious and minor injury crashes involving right turn collisions. Installation of a roundabout to reduce vehicle entry speed. Advance signage on all approaches to the roundabout. Indented bus bays on the western side of Onkaparinga Valley Road.